With an 18 inch Reversible plug orientation, the USB 3.1 Type-C cable supplies Power and Ground regardless of orientation. Keeps with 5Gbps data transfer speeds. USB-C Cable for 18 inch short connections. USB 3 Type-C with reversible male connector on each end. Fully compliant with USB 3 specifications and 5Gbps data transfer speeds. USe with Google Chromebook, Apple Macbook, and other devices supporting USB-C connections. This 18 inch USB 3.1 C-Type cable is the first generation of C to C cables that will support USB 3.0 data transfer speeds of 5Gbps. As new computer systemsare manufactured, they will be incorporating the new USB-C ports such as Google Chromebook, Apple MacBook, and in the future, android phones. 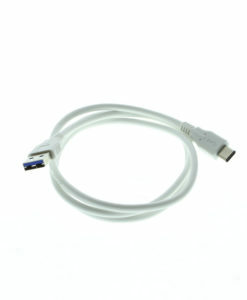 The CM-U31CMCM-18 USB 3.1 C-Type cable has the new reversible connector on both ends of its 18 inch length providing an instant connection from the host receptacle to the C connector enabled device. 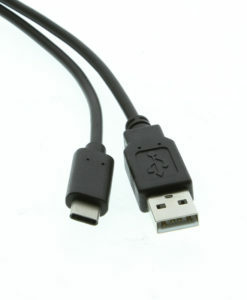 The cable’s operating specification provides for 80°C at 30V with Super High Speed USB transmission. The New C-Type or USB-C connector allows its users to connect to the port receptacle at the host or device without worrying about which way the orientation is. Technology is moving ahead as future generations of the USB 3.1 C-Type connector and cable will support up to 10Gbps of data transfer speeds.